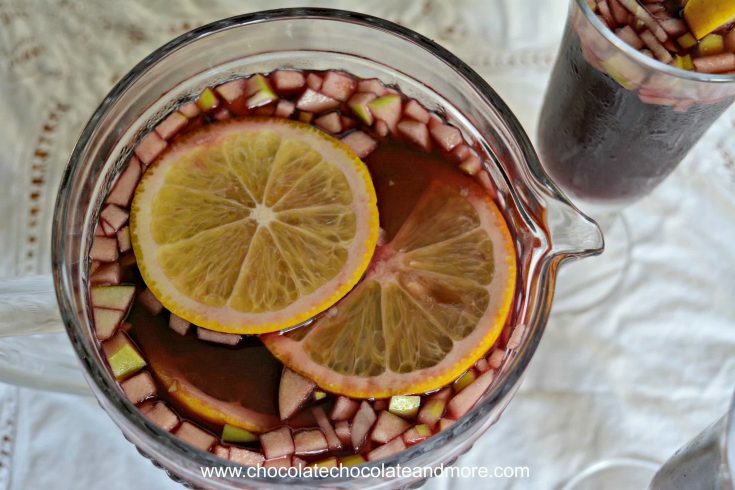 Macanese Sangria - Chocolate Chocolate and More! 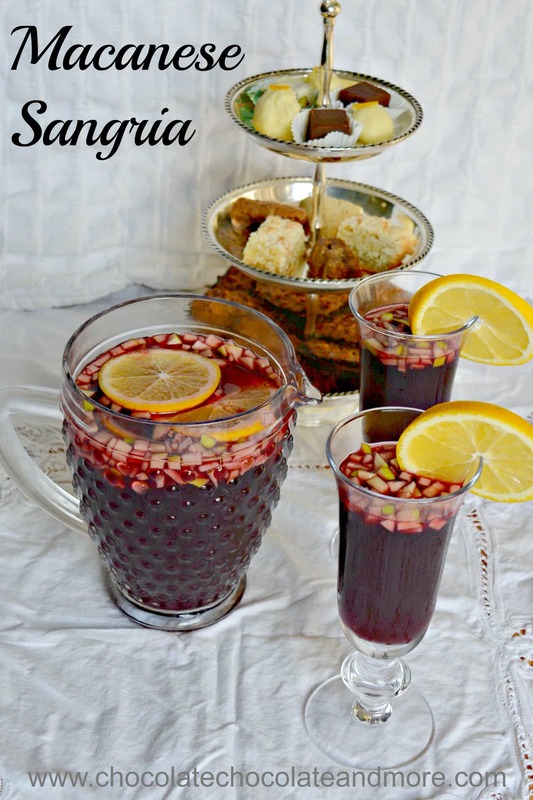 This Macanese Sangria is a tribute to one I had in Macao. The bold flavor of red wine combines with Stirrings mixers, juices, and liquors to make a smooth drink. It’s perfect on a hot day or a holiday party with friends. I visited Macao about a year ago. I wasn’t sure what to expect since I was going for a conference. It’s a small island that’s known for its casinos. I’m not much of a gambler but I do like history. Macao was a Portuguese colony and it’s semi-independent from China. Our host graciously offered a walking tour of the old city. It’s an interesting mix of Portuguese and Chinese influences. You’ll see ancient Chinese shrines nestled in between Mediterranean houses, European style gardens and squares surrounded by Chinese shops. I was surprised by the amount of green space in this densely populated country. One stop on our tour was a place that’s famous for their sangrias. We sat at the bar so we could watch the bar tender make them. I counted types of liquor added to the wine and lost track around 20. I expected something brutally harsh but the flavors blended really well in a smooth drink that wasn’t too potent. 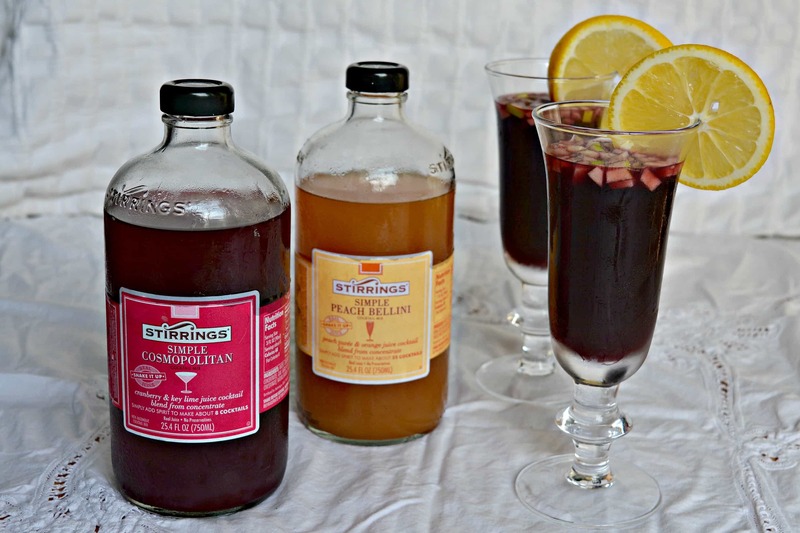 Stirrings Mixers is having a contest to make a holiday drink using their mixers. 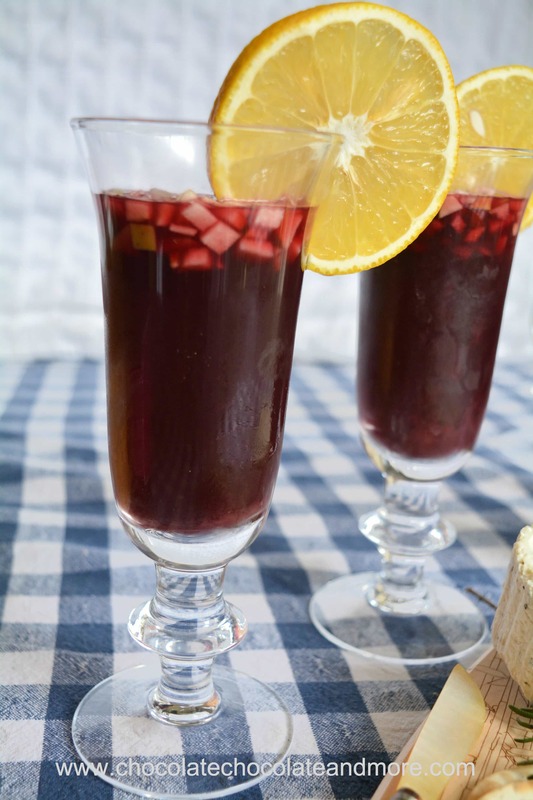 I thought this might be a good excuse to recreate the Macanese Sangria since I’m actually not much of a drinker. I like red wine with a meal and a good margarita on a hot day. This is the first time I’ve created a mixed drink of my own. I used Stirrings Simple Cosmopolitan and Stirrings Simple Peach Bellini mixers. The Simple Cosmopolitan has cranberry and key lime juice. They add some tartness to the sangria. The Simple Peach Bellini is a peach and orange juice combination that gives the Macanese Sangria a smooth taste. Since Stirrings mixers are available nationwide, you can easily find them at a store near you. I found them at Specs here in Texas but they’re also available at 1st Colony Liquors, Total Wines & More, 34 Wine & Liquors, 6S Spirits, ABC Liquors, and 82 Liquor. This recipe makes enough for a small party. The servings at the bar were large – about 8 ounces. This makes about 6 servings. Put wine in a pitcher and mix in all the other liquid ingredients. Garnish with sliced oranges and diced green apples. Serve chilled. 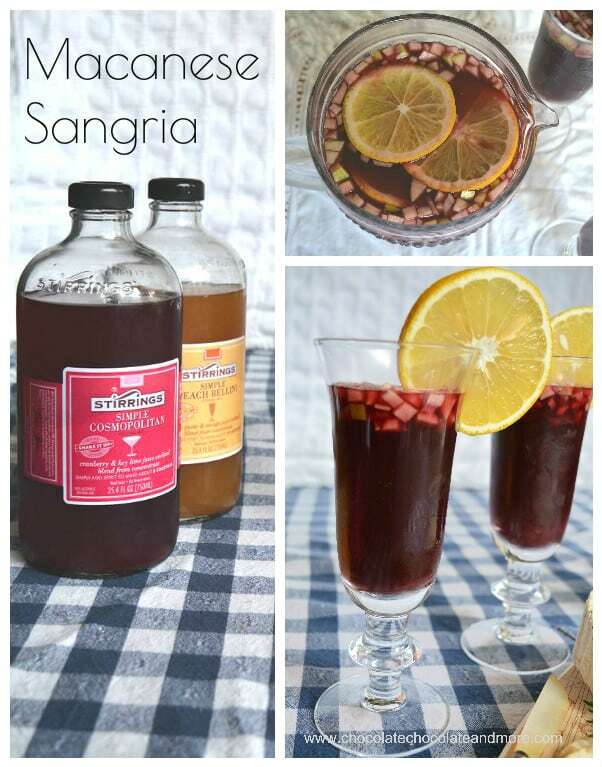 If you chill your ingredients before mixing, the sangria is ready to serve immediately.